It can only mean one thing; Halloween celebrations are just around the corner. And Liverpool doesn’t do anything by halves! From spine-chilling scare attractions and spooky cocktails to thrilling nights out, you’ll find yourself spoilt for choice. So take a look at the best of what’s on this Halloween in Liverpool. 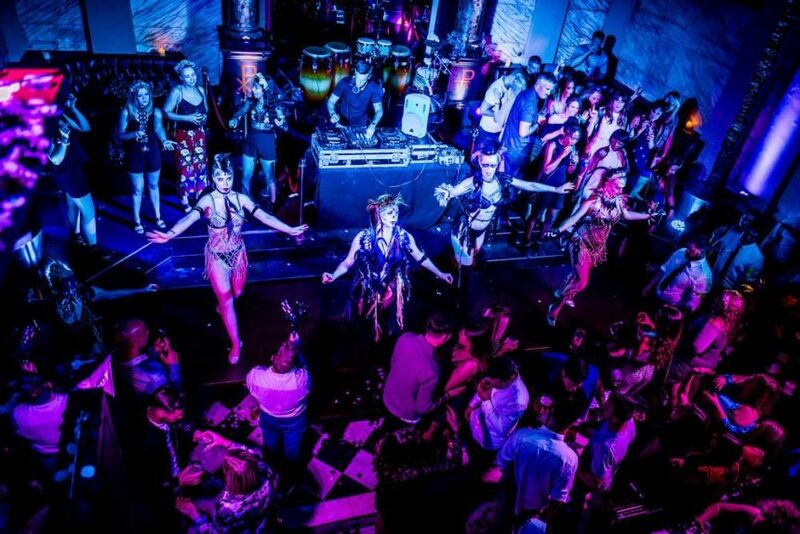 This week, prepare to be dazzled at Alma de Cuba in Liverpool. The iconic venue and former church couldn’t be more atmospheric. Dance beneath Alma’s striking original alter and glistening stained glass windows for a mystical night that you’ll never forget. This Thursday, Alma is playing host to the Whitechapel Celebrity Legends Halloween Ball, raising money for Liverpool’s leading homeless charity. Showcase your best moves to guilty pleasures spanning the decades, discover your fortune and see Alma’s famous dancers in action. So come along, make a donation and experience this exquisite venue filled with haunting Halloween twists for one special night. 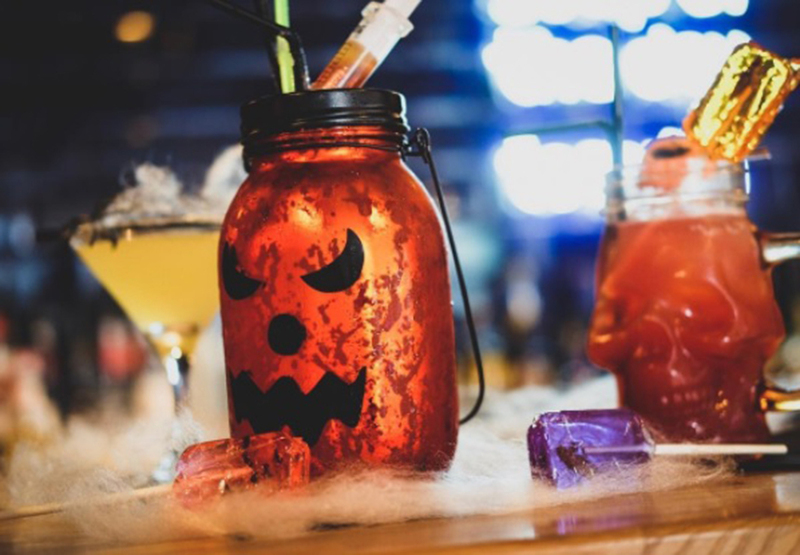 Treat yourself this Halloween to spectacularly spooky cocktails at Vista Bar & Restaurant! The Vista team have been busy crafting, stirring and mixing special concoctions for the Halloween season. If you dare, choose from an array of frightful potions that taste just as impressive as they look. You’ll find Vista located on bustling Hanover Street, only a short stroll from Arthouse Hotel. 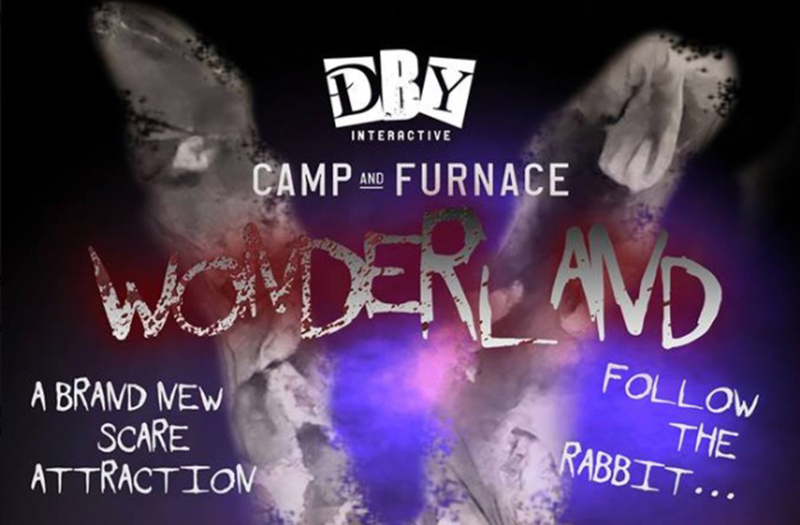 This Halloween, why not give the ordinary night out a miss and take a journey into Wonderland? Take on the task of outwitting the notorious Madhatter himself and follow the clues to Alice. You can expect to see some frightening faces along the way as you twist and turn through games and puzzles in this terror experience. The spine-chilling new scare attraction is located within popular warehouse venue Camp and Furnace. So if you’re visiting Liverpool over Halloween, this is the perfect chance to see what the fuss is all about! On 31st October itself, see one of Liverpool’s best loved clubs transformed into the Haunted Forest. 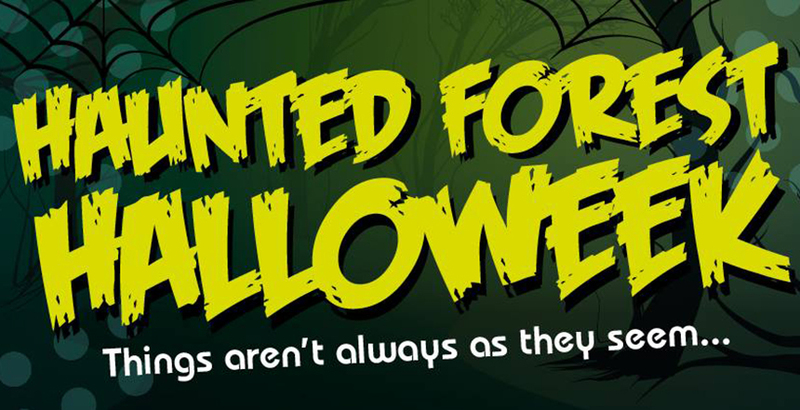 You can expect cheap and tasty Halloween drink offers and plenty of frightful fancy dress. Popworld is renowned for bringing pop-lovers of all ages under the one roof, united in belting out the classics! Dance like no one’s watching as you embrace the very best and worst of pop music, certain to have a few spooky twists. Since Baltic Market opened its doors earlier this year, the quirky street food market and bar has only gone from strength so strength. And this Halloween, the fantastic team behind its events are throwing an unmissable Halloween weekend. You can expect everything from Halloween cocktails and terrifyingly themed food to the grim reaper himself on the decks! Don’t forget to dress to impress, as you’ll soon be in the Halloween spirit and up on your feet for a boogie. 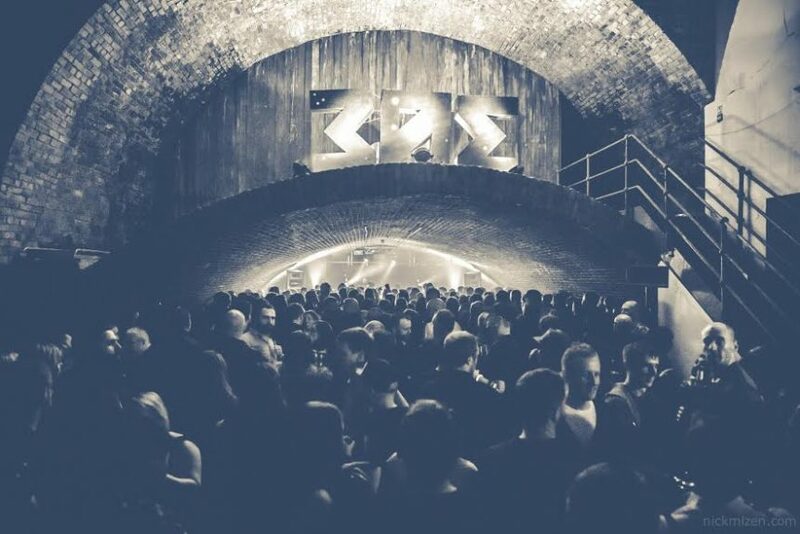 What better venue in Liverpool to celebrate Halloween than the atmospheric Williamson Tunnels? Liverpool clubnight 303 will be filling the eerie space on the biggest night of the year, so you won’t want to miss it! 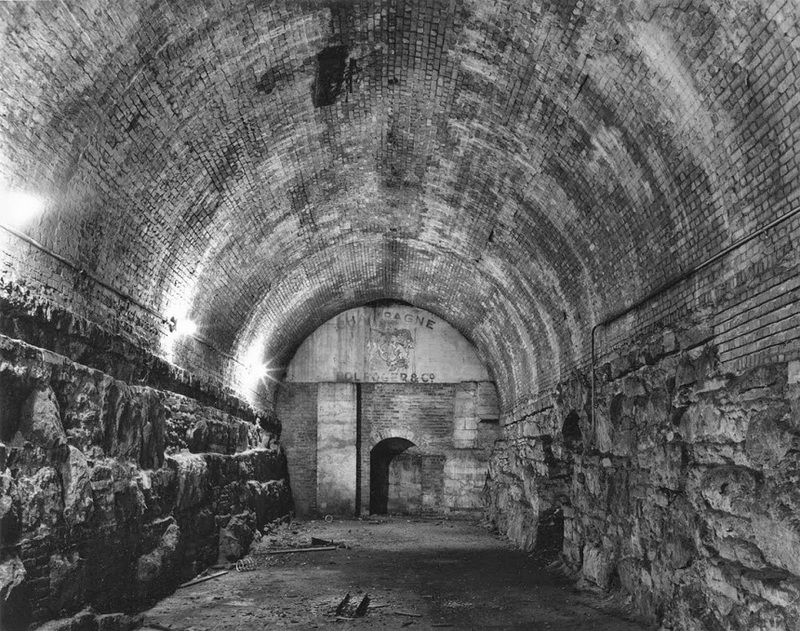 Created by Joseph Williamson back in the early 19th Century, the fascinating underground space plays host to an array of vibrant events. Party like never before as you soak up the historic feel of the venue for a dance party that you’ll never forget. Expect the best of techno and dance music, featuring The Selador Boy, Dave Seamen and Steve Parry. At Arthouse Hotel, we like to celebrate the wonderful, weird and simply spooky all year round. Signature Living are renowned for a unique approach to accommodation, and Arthouse is one of our newest spaces in the city. The eccentric movie-themed hotel features an array of dazzling rooms based on the very best of art and film. 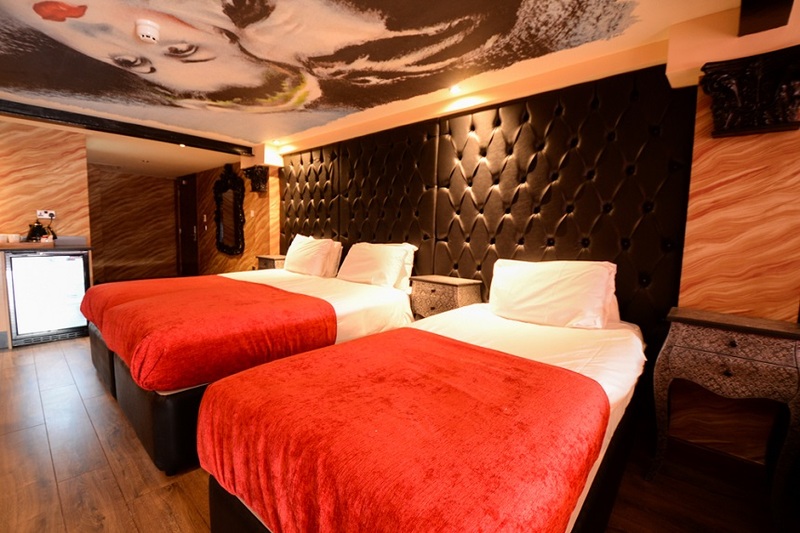 Arthouse Hotel is located within the centre of Liverpool’s buzzing nightlife scene on Seel Street. You’ll also find the city’s mot famous landmarks and shopping district Liverpool ONE within walking distance. 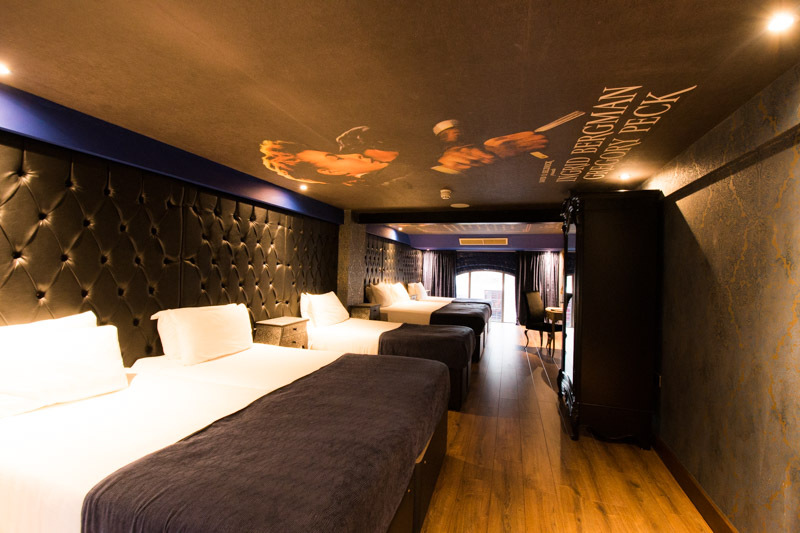 Bringing a touch of the extraordinary to Liverpool city centre, our themed rooms are perfect for nights out in Liverpool. So why not make this Halloween extra special by staying in one of our most spooktacular rooms? Step into the mind of the “Master of Suspense” in our Suspicion room, based on the 1940s Hitchcock classic. And for those ready to embrace the extravagance of The Rocky Horror Picture Show, our Rocky Horror Show room is calling your name! Step into a time warp as you take in your spacious surroundings equipped with fantastic facilities. You’ll find everything you could wish for right within your room, with plenty of space for getting ready within a group. Prepare some drinks before heading out with your very own kitchenette, or take a well earned soak the next morning in the relaxing double whirlpool bath. 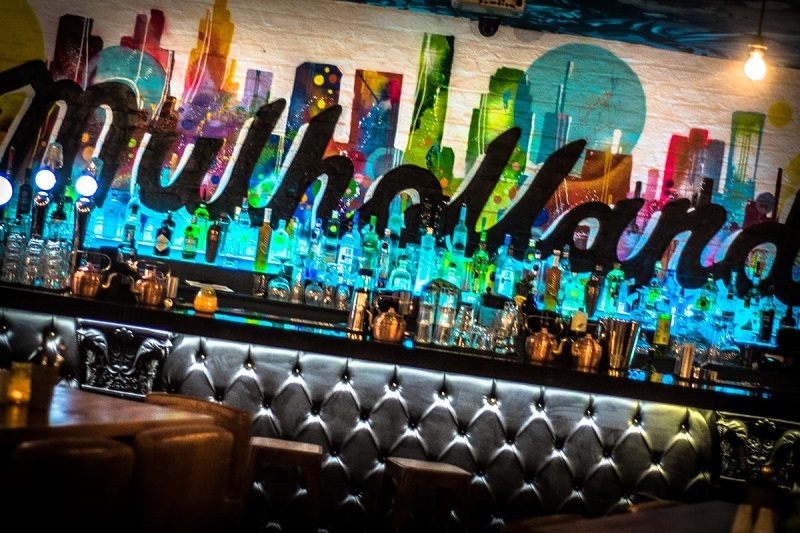 Mulholland Bar is located on the ground floor of the hotel, so you can start your night in style with us. Mulholland is a favourite for groups of friends and family celebrating special occasions. With fantastic music, great food and drink and a relaxed atmosphere, you’ll soon feel right at home. To enquire further or to book your stay with Arthouse Hotel, you can contact us on 0151 601 8801 today. Our friendly team will be able to find the ideal room for you and your group for the ultimate overnight stay. 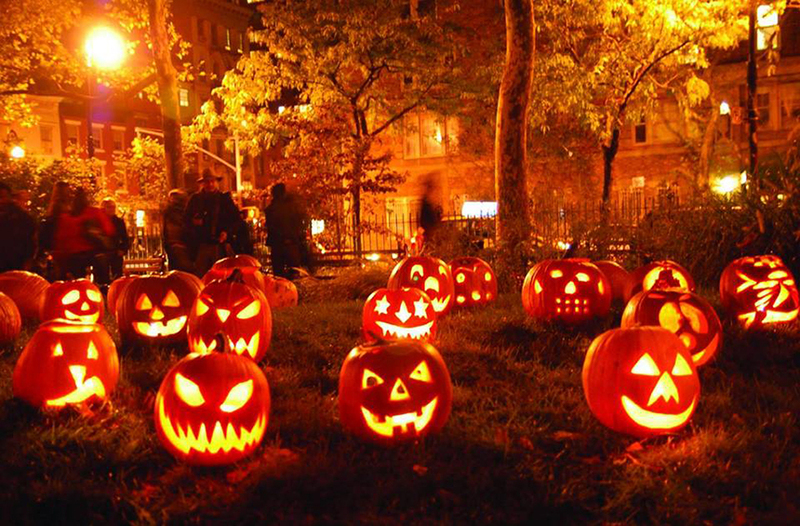 We wish you a scarily great Halloween night out in Liverpool and hope to see you very soon! 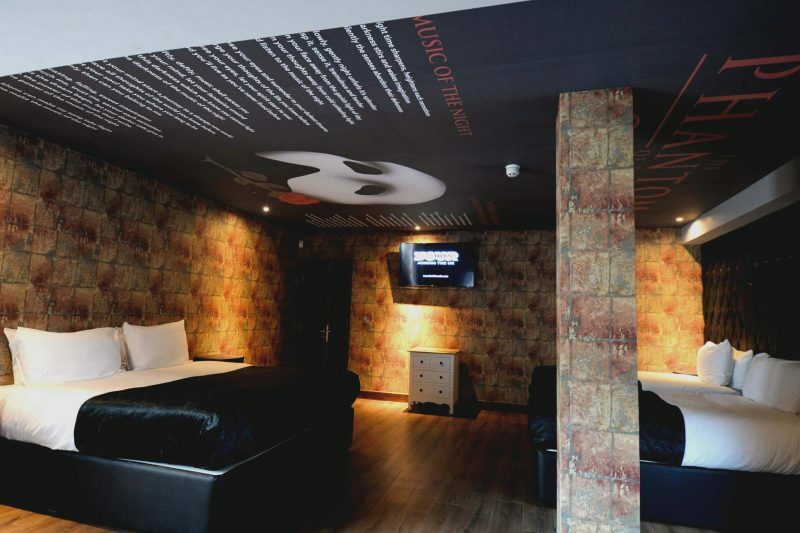 Book a stay on the Alfred Hitchcock floor at Arthouse Hotel and have a scream this Halloween in Liverpool with all your friends. Halloween is just around the corner so we’ve taken a look at how the master of macabre, Alfred Hitchcock, chose to celebrate his love of horror and haunting. The bash he threw for the Warner Brother top brass in March 1956 showed that Halloween must have surely been his favourite time of year. Our Hitchcock movie-themed hotel rooms are dedicated to the great director and his work, to help our guests celebrate all things spooky in style. 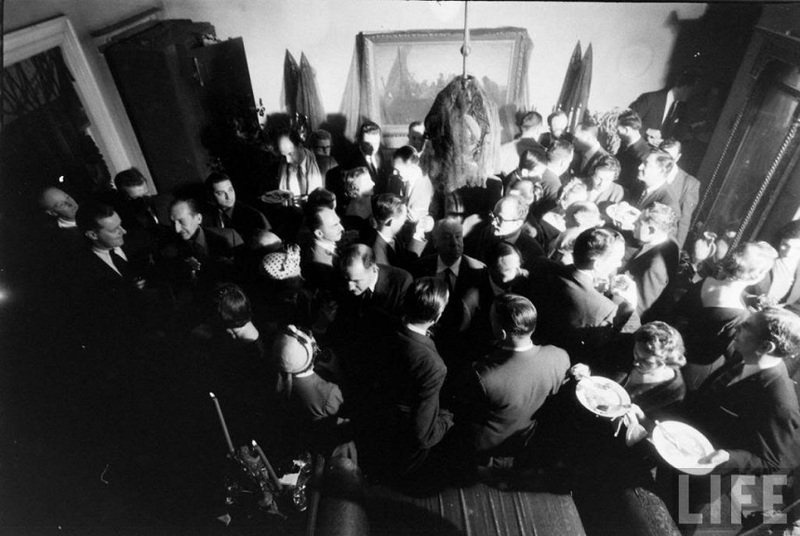 Check out this amazing account of the spookiest party in town during 1956 at Alfred’s own horrifying New York Haunted House Party. In true Hitchcock fashion, it was all about location, location, location when it came to planning his grand New York Haunted House Party. He sent out his team, Young and Rubicam, to track down a Hitchcock appropriate venue to host his hotly anticipated house party. The task at hand seemed daunting at first when the team first attempts to secure out a genuine haunted house in New York. They came up trumps with Hitchcock’s first two criteria but were stumped time and time again when it came to finding a real live haunted house. 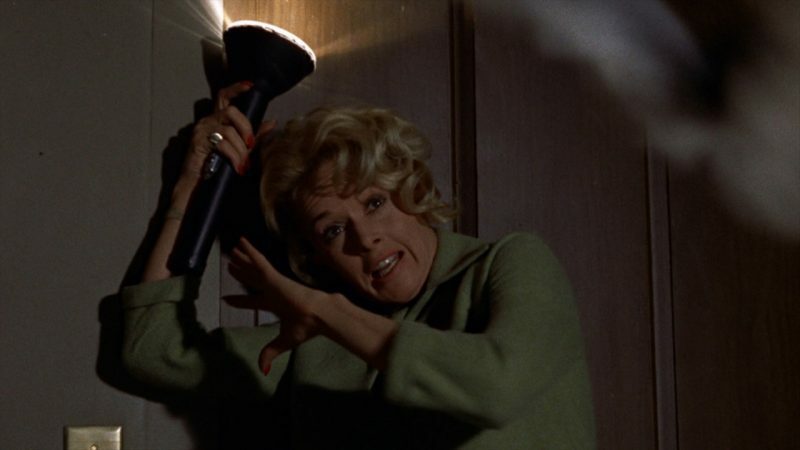 Luckily a tip came in that the wine cellars under the Brooklyn Bridge ticked all the boxes on Hitchcock’s list. Together Young and Rubicam and an excited Mr Hitchcock took a tour of the cellars and discovered, at last, the ideal space in which to host Hitchcock’s epic Halloween bash. The walls were dripping, dank and dark and even the whispers of the team members echoed around the cavernous space creating ghostly whispers. Sadly a Hitch presented itself. There was no plumbing throughout the cellars and Hitchcock’s most distinguished guests could not expect to go without washrooms for the entire shindig. Prices for temporary fixtures were assembled totalling $800. The wine cellars were a no go and the search continued. 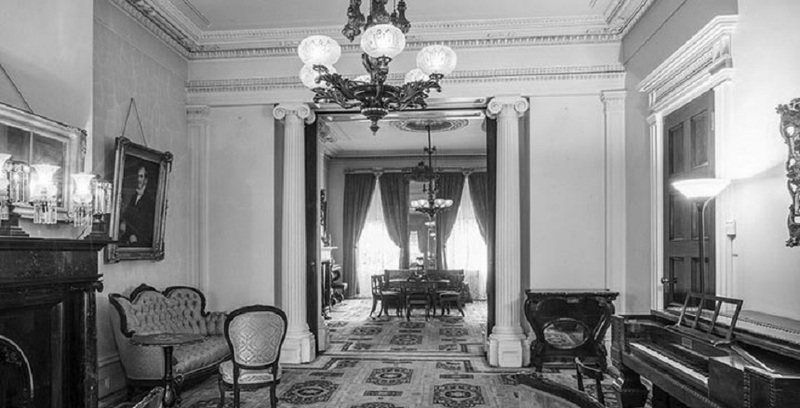 The people of New York all began to get involved in the search and tips kept rolling in about supposedly haunted buildings that were ideal for Hitchcock’s house of horrors. The Old Merchant House was scouted as another possible venue. The perfectly preserved period home was ideally spooky and was rumoured to have ghosts of its very own. Those who inherited The Old Merchant House told stories of ghostly happenings. 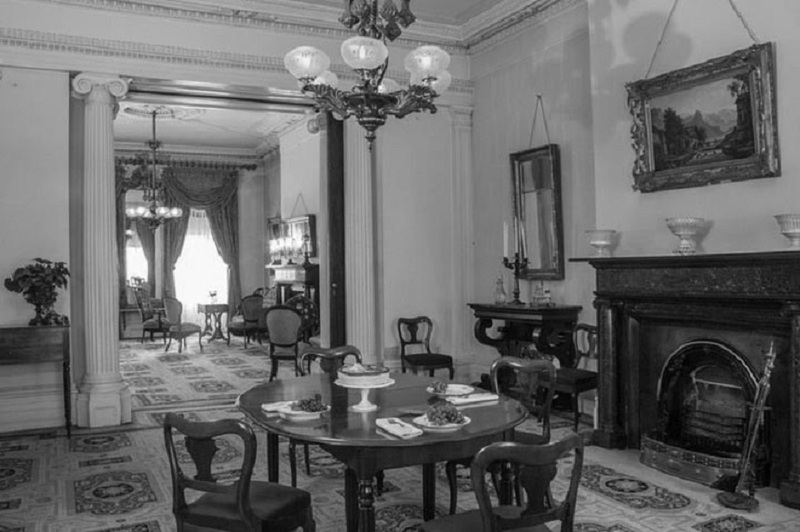 Convinced that nine members of the Treadwell family who lived and died on the property continued to haunt it they opened the home up as a museum. 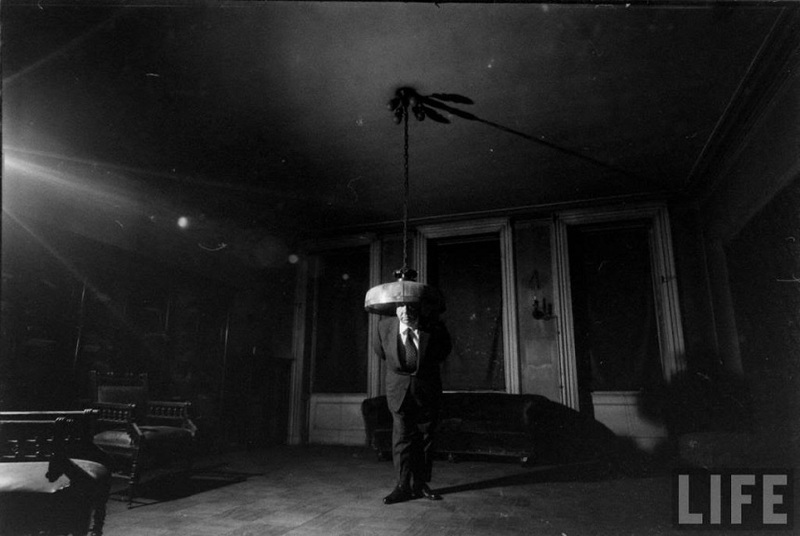 Hitchcock, upon visiting the house was overjoyed with the preservation of the home and believed it would make a smashing venue for his VIP haunted house party. 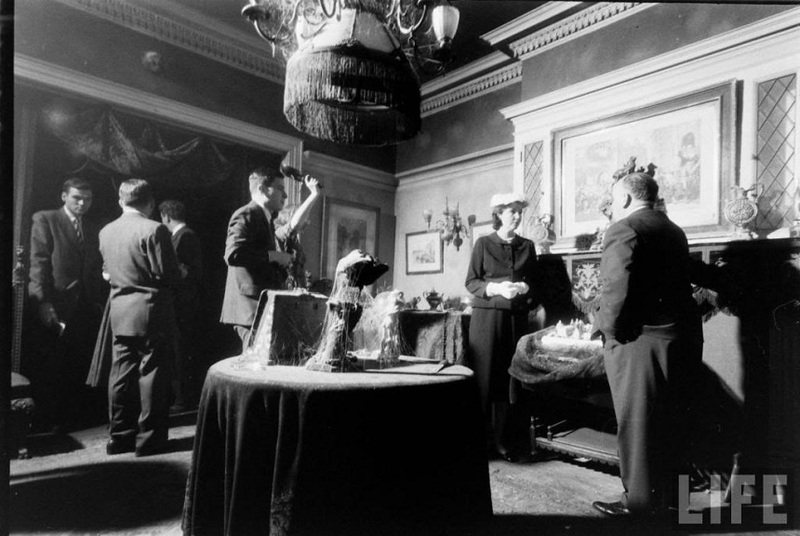 source: landmarkinteriorsAgain, it was not to be as the kin of the Treadwell family could not consider a party being held inside their historical landmark giving Hitchcock and his team a blunt no when the idea was suggested. Today The Old Merchant House is still perfectly preserved and receives regular visitors with a keen interest in the history of the home and its haunting past. Taking matters into his own hand Hitchcock reached out to the American Psychic Research Society who responded that New York had become too modern a city to host any sort of supernatural spirit. Hitchcock then placed an advert in The Times real estate section asking for people to call in with any ideas. Young and Rubicam were bombarded with over 100 telephone calls a day but none of the leads could conjure evidence or even stories of ghostly presences in their proposed properties. There were suggestions of homes in Jackson Heights with real graves in the garden, a place in Englewood for sale with reports of a poltergeist but Hitchcock preferred to stay in the city centre. On Staten Island, there was an agent trying to rent his property to Hitchcock for $5000 because it had nightly spiritual torments which gave Hitchcock chills but not because of the ghosts. After his short but exhaustive search for the most haunted house in New York Hitchcock and his team settled on the towering townhouse on 7 East 80TH Street. 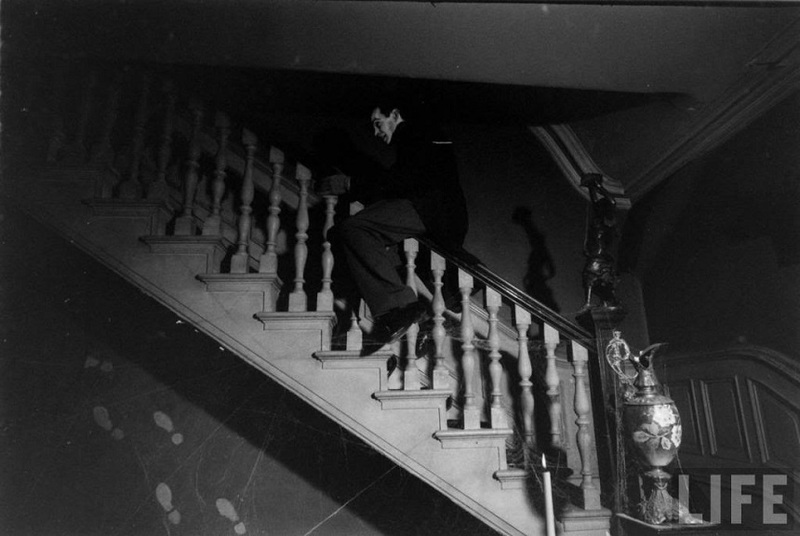 The abandoned cobweb-laden mansion was sans spirits but Hitchcock’s patience was spent and he settled for a venue that looked haunted but wasn’t. This was no problem for the master of suspense and horror as he and his crew set to work stirring up the dusty corners of the extensive property and adding some eerie extra touches here and there. Hitchcock placed coffin shaped bars around the home, and well placed hidden speakers provided spooky moans and groans of fictional ghoulies throughout the building. Using the ancient furnishings to his benefit Hitchcock accentuated the decay of century-old paintings, elaborate antique chandeliers and thick dusty drapes. The perfect mood lighting was installed and Hitchcock’s haunted house party was finally taking shape. A stickler for the finer details Hitchcock ensured that if he couldn’t frighten his guests with real ghosts he would try instead with his party menu. Guests came dressed to impress in all manners of upper-class attire, and photos show that the drinks were flowing as the spookfest played out. 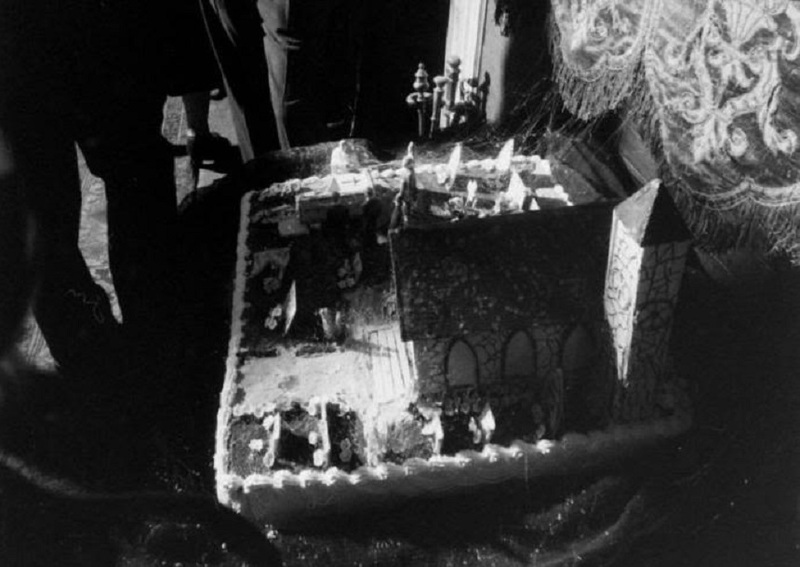 On top of all the extravagant food, there was also a detailed party cake made to resemble a church and graveyard, complete with inedible cobwebs draped across so that it almost looked a part of the house. Not to leave things to chance Hitchcock utilised his movie know how to give his guests an extra fright in the night. One of his cheeky tricks included a decrepit old man left in one of the upstairs bedrooms. Clever makeup and special effects made this character seem like he could have been left to pass away in the house and forgotten. 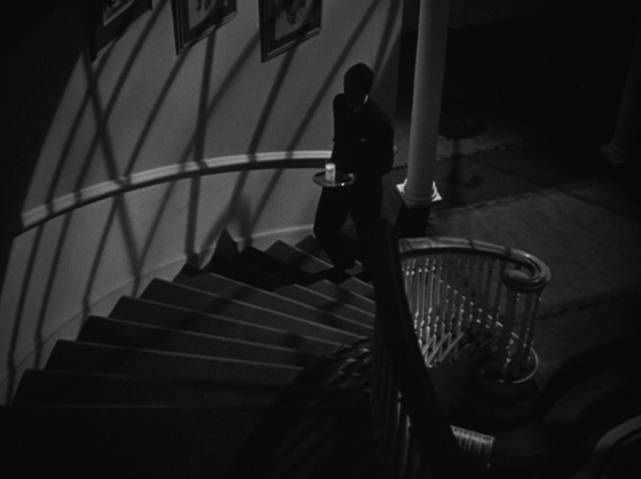 This was not the only haunting house party Hitchcock threw during his years as master of suspense. Other notorious party rumours circulate about the director hosting events in LA where guests were handed shovels and asked to exhume several buried skulls bureid around the property garden. If we could attend any Halloween party we think Hitchcock’s soirées might have been the most terrifying ones of all time. We know that any party might pale in comparison to Hitchcock’s fright fests but there are plenty of spooky happenings going on during Halloween in Liverpool 2017. Book to stay in one of our Hitchcock hotel rooms at Arthouse Hotel this Halloween and prepare to be dazzled by the décor and enticed by the exquisite ensuite bathrooms. Arthouse Hotel is right in the middle of all the best Halloween action taking place in Liverpool. Make sure you get yourselves booked into one of our Hitchcock themed suites or our other movie-themed hotel rooms and have yourself a scream this Halloween. Call 0151 601 8801, email info@sigantureliving.co.uk or check out some of our best accommodation offers here and book direct. With Freshers Week over and the Uni work starting to pile up, it’s time to have a break from work and start planning your next student night out. 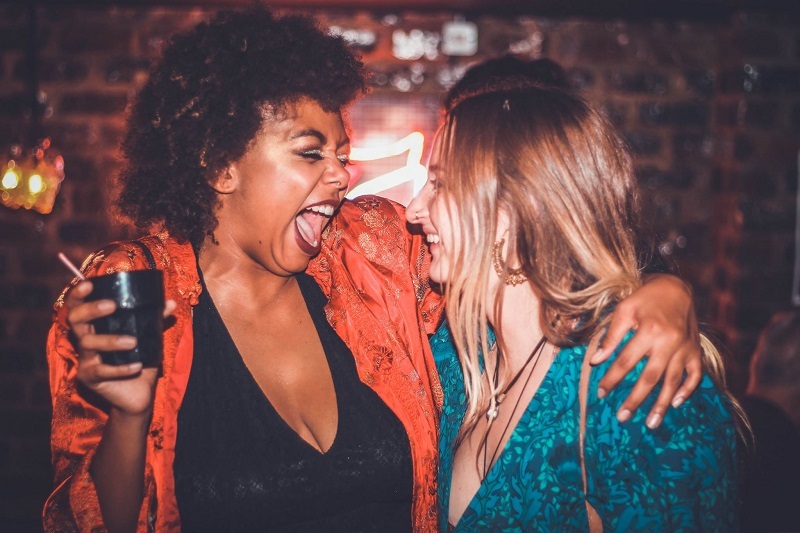 Seel Street is at the heart of Liverpool’s vibrant nightlife, with Concert Square just a few minutes’ walk away and an abundance of quirky bars and clubs to choose from, it’s the ultimate destination for a student night out in Liverpool. 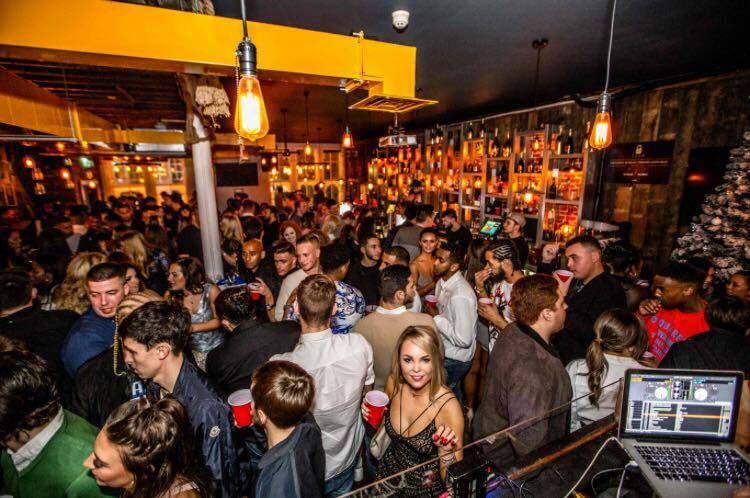 To help you choose, we’ve rounded up the best student friendly bars and their best deals, so get out of the library and check it out. One of the coolest and newest bars on the block, Mulholland is the perfect destination for a boozy student night out. Designed with an American theme in mind, this vibrant club is known for its amazing cocktails, brilliant beer offers and cheap eats. Set within the Arthouse Hotel, but with a whole identity of its own, this quirky new venue transports visitors into a vintage Hollywood bar experience. Mulholland is one of a kind. Beers galore, delightful cocktail concoctions and a superb mix of music across three floors, Brooklyn Mixer is one of the top student destinations in Liverpool. Known for its ‘big beats’ and cheap drinks, this venue hosts regular DJ’s one the different floors and events throughout the week. The bar is stocked with Brooklyn beers, as well as an extensive cocktail menu and all the spirits you could dream of. Known as Heebies to just about everyone that’s ever been, this famous club makes for a much loved student venue. Renowned for its bustling courtyard and three floors of music, there are few bars with better spaces to mingle with locals than Heebie Jeebies. Expect eclectic DJ nights and live music with amazing drinks deals, this is one of the best places to visit as a student. With an electric atmosphere and good tunes, you’d be mad not to go. The new venture from the team behind Heebies, The Jacaranda and Jacaranda Records, EBGBs is set underneath the famous Heebies and prides itself on being both a bar and a club. The Lone Wolf Bar has been designed as a chilled out biker inspired bar room with high quality drinks as well as the cheap and cheerful bottles. The club room hosts nights including Liverpool’s longest running alternative/indie night Liquidation, as well as shows from different performers every night, ranging from the House of Suarez Vogue performers, Monster Cirques fire dancers and a crew of break dancers and roller girls. The Raz is a student heaven and a rite of passage to any first year. 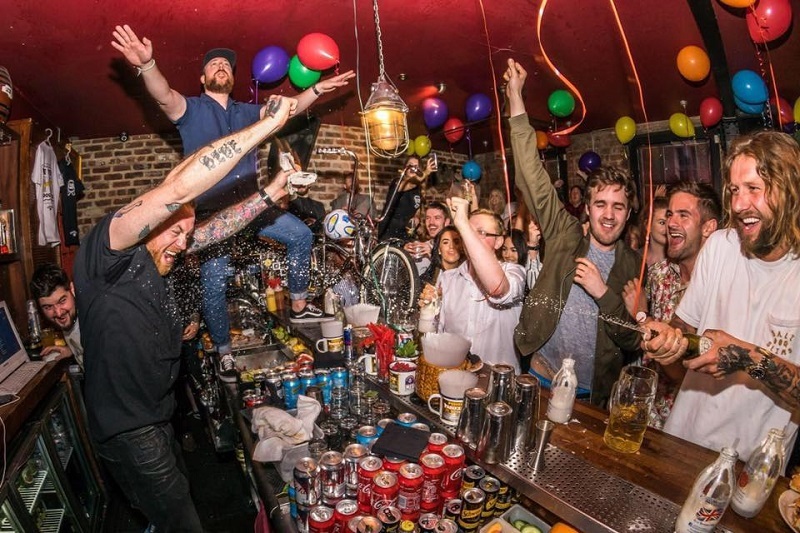 This grimy bar is renowned for having ridiculously cheap drinks and is without a doubt the place to go if you’re looking for a very inexpensive night out. Choose from strange concoctions like the Fat Frog or an alcoholic slushy and come home with change from a tenner. You’ll grow to love the sticky floors, sweaty walls and the infamous Raz flu following a night out there. Monday night is Raz night, but get there early if you don’t want to queue around the block. Seel Street’s resident dive bar may be known for its delicious steins and brine, but Salt Dog Slims also comes alive after dark. A combination of German and American culture, this popular bar is the creation of the wizards behind Santa Chupitos and El Bandito. Expect to pay a bit more for your cocktail, but they are well worth it and the atmosphere is always brilliant. They also have a secret speakeasy style bar upstairs that you can only enter with a special code, ask behind the bar for more info! It’s one of the best kept secrets in Liverpool . . . well, maybe not anymore. Empire is a prime nightlife hotspot playing everything from disco, funk, hip hop, RnB, deep house and club classics mixed by local and international DJs. A four floored wonderland at the heart of Liverpool’s nightlife, Empire is its very own little kingdom and the most popular destination for a student night out. There’s the unique ‘States’ floor which features a chic LA bar and sleek decor, the ‘Grande’ floor with an exclusive VIP section, a quirky Tzar floor and finally the lower floor, Dojo, has a distinct oriental theme with Geisha girls and a Sintillate music policy that never fails to get feet moving. 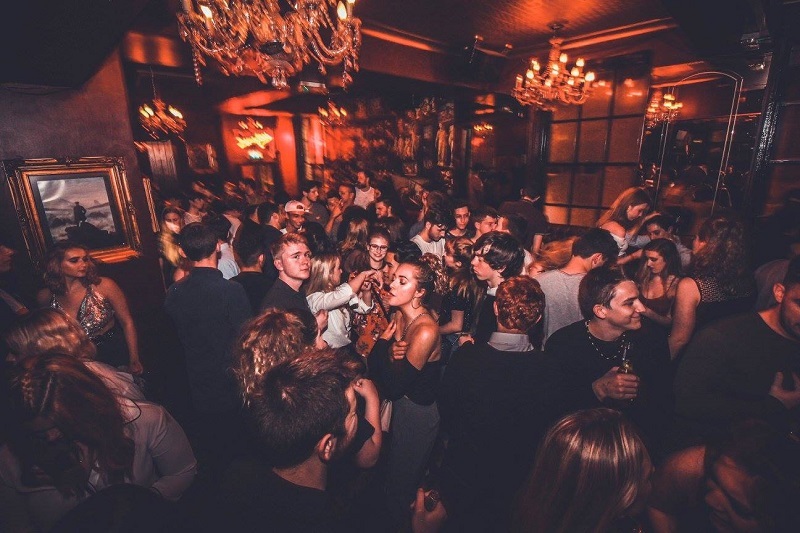 Recently voted Liverpool’s best bar, Alma de Cuba fuses electrifying Cuban, Hispanic and Latin American culture into Liverpool’s nightlife scene. This vibrant bar was once Liverpool’s oldest Catholic Church and still retains some of the amazing original features. The insides of the former church are illuminated by ethereal candles, stained glass windows and dazzling chandeliers, with the stunning alter still intact today. 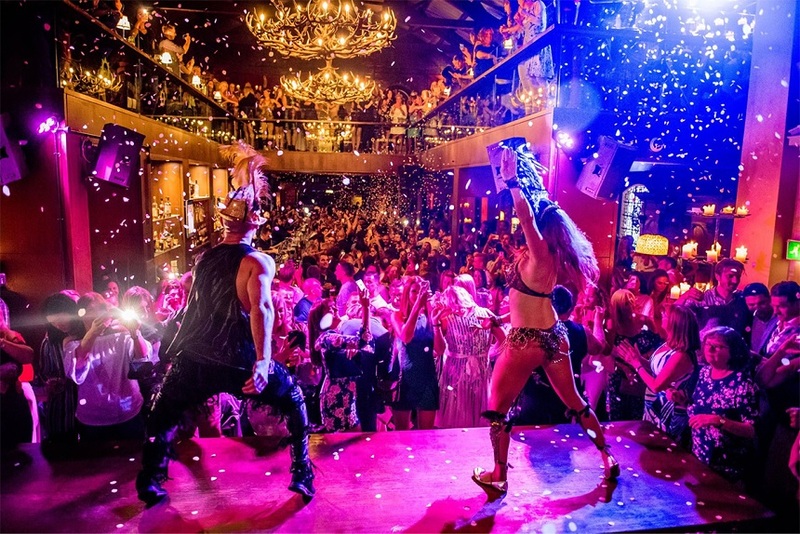 Renowned for its delicious cocktails, you can expect everything from shimmying Salsa dancers to mesmerising petal shows and vibrant entertainment from Alma’s resident DJ. This stunning converted church is sure to be the highlight of any student night out. 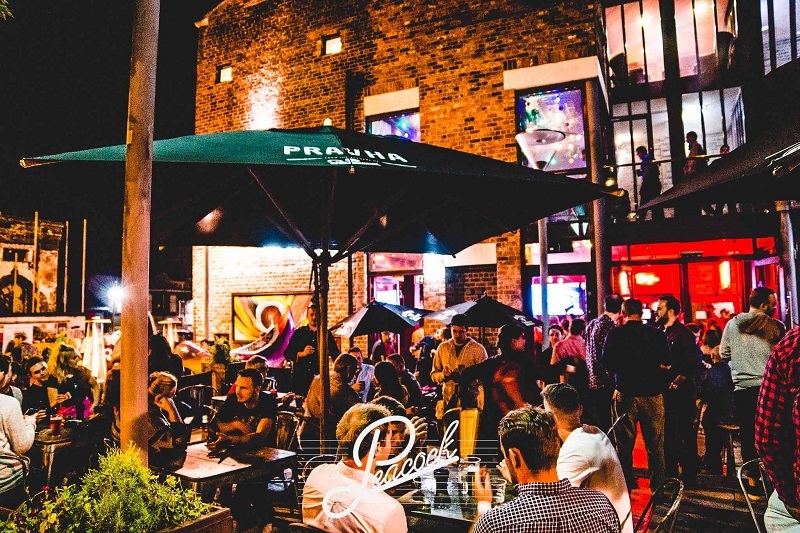 Located just off Seel Street, LA’GO keeps its doors open late and resident DJ’s provide a top mix of funk-fusion so you can groove into the early hours. Free entry and great deals on booze, you can top up and soak up the lively, intimate atmosphere without spending a packet. Follow the bar along and you’ll find sofas and a Foosball table for a fun and fair method of deciding who buys the next round. LA’GO’s is the perfect destination if you’re looking to have a boogie into the early hours. One of Liverpool’s leading music venues, the Arts Club is a hub for brilliant live music gigs and electric clubs nights. Arguably the best night they host is Medication, the most iconic and famous student night out. 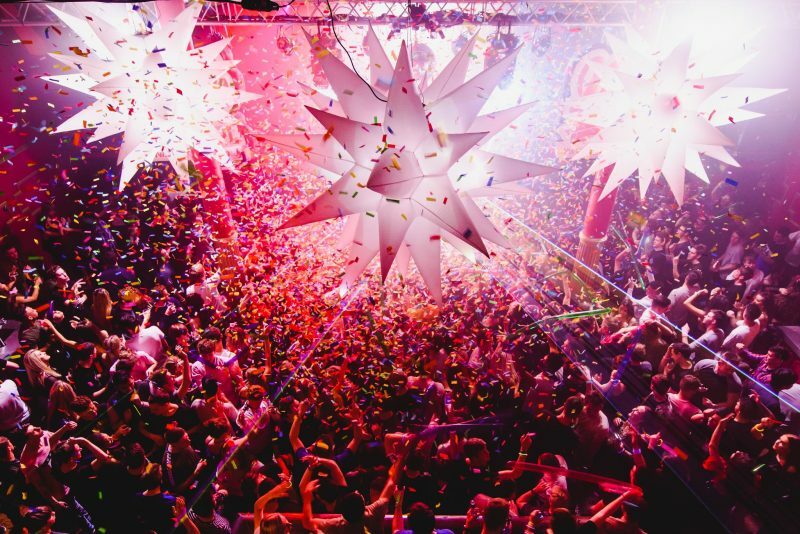 Every Friday, the club is transformed into a colourful, dance lover’s heaven where confetti is thrown and laser are shone until the early hours. With top DJs playing the most famous hits, this night is a must on the student circuit. Sitting at the top of Seel Street, The Peacock features a large beer garden and various floors to enjoy a range of music genres. They are famous for their free BBQ’s and tasty woodfired pizzas that are perfect for soaking up the alcohol. The ideal destination for a late night tipple and a boogie on the dance floor, this student friendly bar offers cheap eats and delicious cocktails that will have you staying until it closes. Fondly known as ‘The Kaz”, this alternative hideout fuses earthy hippy vibes with electronic music, in a festival environment tucked away behind the most urban streets of Liverpool. 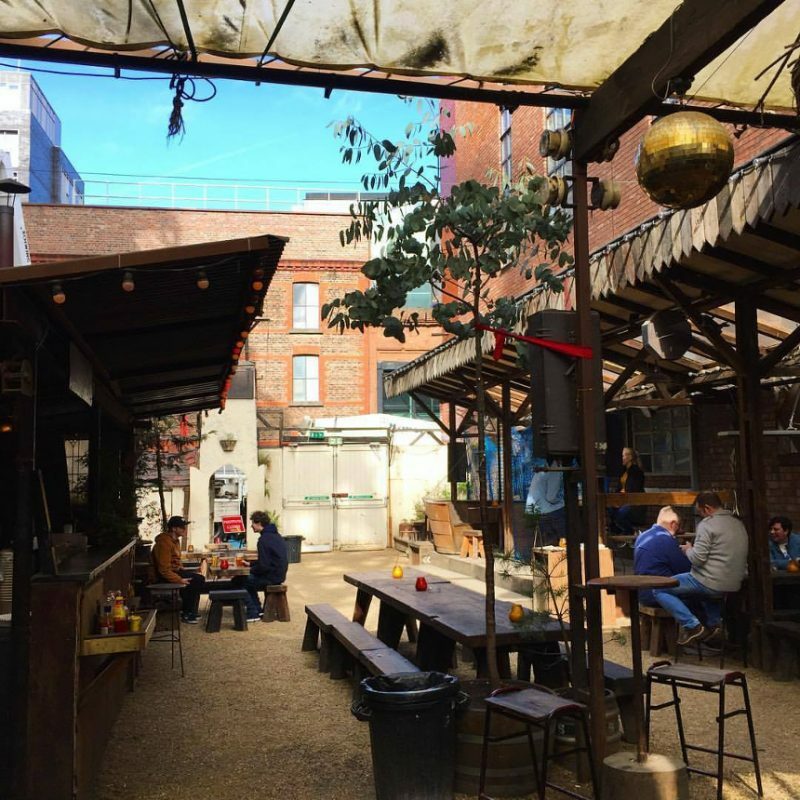 Kazimier Garden is a rustic, botanical haven filled with mismatched furniture and outdoor décor that makes the perfect place for a night out with a difference. Even when the weather is chilly, you’ll find The Kaz full to the brim with music lovers and locals. This cosy wonderland is one of Liverpool’s first and best loved hidden gems, it’s one of the most unique venues in the city. Set slightly back from the hustle and bustle of Seel Street, Be At One is a cocktail heaven for anyone who’s into their mixology. They offer pretty much every single type of cocktail you could ever imagine, this bar offers drinkers over 150 different types of drink, from classic favourites, decadent ice cream concoctions and mocktails to suit every taste. 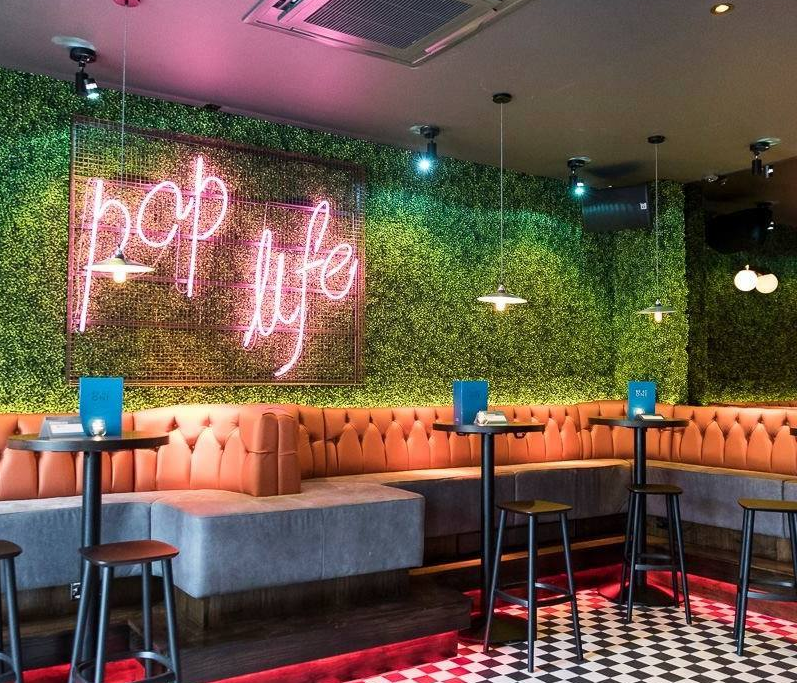 Inside it’s playful and bright, with colourful seats, faux grass hedges and neon signs that blend Liverpool’s musical heritage with pop art. There’s Happy Hour every day, which lasts at least three hours and all day on Sundays, the perfect student night out. If living in halls is starting to drag, have the ultimate student night out with a stay in the amazing Arthouse Hotel. Located in the heart of Liverpool’s nightlife, this hotel is the number one destination for luxurious group accommodation. So, if you want to make the most of living in our glorious city, get in touch with our team today and book your stay. Follow the yellow brick road to your worst nightmares and have the scariest night of the year with a spooky stay at Arthouse Hotel for Halloween. At Arthouse Hotel, it’s clear we love a good movie or two, but what you may not know is we also adore horror films! With Halloween fast approaching, it’s time to start planning how you’ll be spending the spookiest night of the year. From terrifying classics to thrilling murder mysteries, our hotel has a scary movie-themed room to suite every Halloween fan. The perfect hotel for fans of classic horror films, at the Arthouse we have a whole floor dedicated to ‘The Master of Suspense’, Alfred Hitchcock. 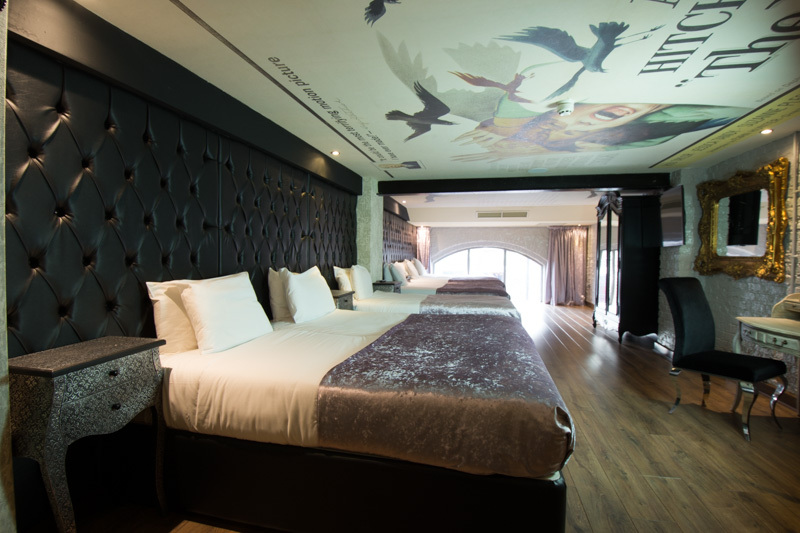 From rooms focused around the infamous Suspicion to a stunning tribute to The Birds, you’re sure to have a frightful night. Choose from eight Hitchcock themed rooms, sleeping between four and six guests, and get ready for an eerie Halloween night. One of our favourite rooms from the Hitchcock floor is our tribute to The Bird’s. This dark and decadent room transports its visitors into the mind of one of the greatest filmmakers, with a horrifying mural from the film set on the ceiling. A critically acclaimed thriller, Hitchcock’s The Bird’s is a suspense-filled masterpiece revolving around a love story between a stunning blonde starlet and a handsome heartthrob, until things take a terrifying turn for the worse. Adapted from a 1952 short story written by Daphne du Maurier, Hitchcock masterfully plays on the human emotion of fear in this all time classic. Known for his devious methods whilst filming, during the filming of the attic scene he forced the leading actress to work for 5 days in an enclosed space using live birds instead of mechanical. Even though his methods were almost maniacal, The Birds goes down in history as the greatest thriller/horror movie of all time. One of Hitchcock’s most gripping horror films, the world of The Birds is the perfect place to spend All Hallows Eve. Next up is undoubtedly one of Alfred Hitchcock’s best loved psychological thrillers, Suspicion. A twisted and spooky tale of love and betrayal, this tense film follows the story of Johnnie Aygsgarth and Lina McLaidlaw’s, portrayed by the legendary Cary Grant and Joan Fontaine. When handsome gambler Johnnie crosses paths with shy and bookish Lina, love blossoms and they quickly marry. However, it’s only after their honeymoon that the truth behind Johnnie’s façade begins to unravel and turn dark. The plot twists and turns as Hitchcock builds the suspense until it is uncovered that Johnnie’s friend, Beaky, has been mysteriously murdered. Lina starts to question everything and has the suspicion that Johnnie is the murderer. Will she be next? From its impeccable casting to its chilling musical leitmotif, Suspicion is certainly a timeless masterpiece in cinema and the perfect backdrop to a spooky stay at Arthouse. With dark and ghostly interiors and blood red bedding, this spine-tingling suite is sure to raise the hairs on the back of your neck. Get enchanted by our mesmerising Spellbound room and come on a spooky journey to discover your psyche. One of Alfred Hitchcock’s most psychological films, Spellbound delves into the mysterious world of psychoanalysis, a technique of bringing unconscious memories and thoughts to the surface as a therapeutic technique and treatment for some mental health issues. Based on the thriller The House of Dr Edwardes, the predominantly black and white film invites us to Green Manors, a mental hospital in Vermont. Here, we meet Dr Constance Peterson, a cold and emotionless female psychoanalyst, and learn that the current director of the hospital, Dr Murchison, is being forced into retirement after taking a leave of absence for nervous exhaustion. His replacement comes in the form of Dr Anthony Edwardes, a very young and attractive man. Dr Petersen grows suspicious of the impossibly young director and discovers a mystery that will take all her psychoanalysing skills to solve. 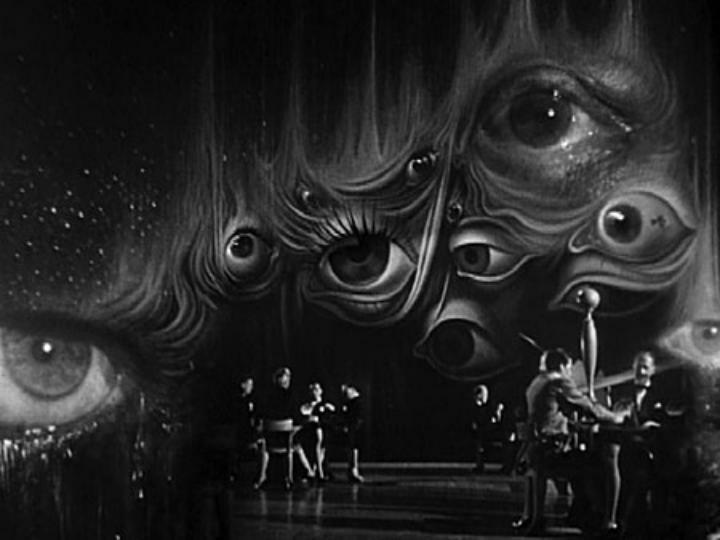 One of the film’s most mysterious scenes is famed surrealist artist Salvador Dali’s conception of the film’s key dream sequence. Hitchcock gave Dali free rein of the sequence, with only minimal plot pointers and the sequence ended up being 20 minutes long. It was eventually cut down to just two minutes, but it is still one of the most unique and unnerving sequences in cinema. Spellbound is dark, mysterious and artistic, a true icon in the Hitchcock collection. 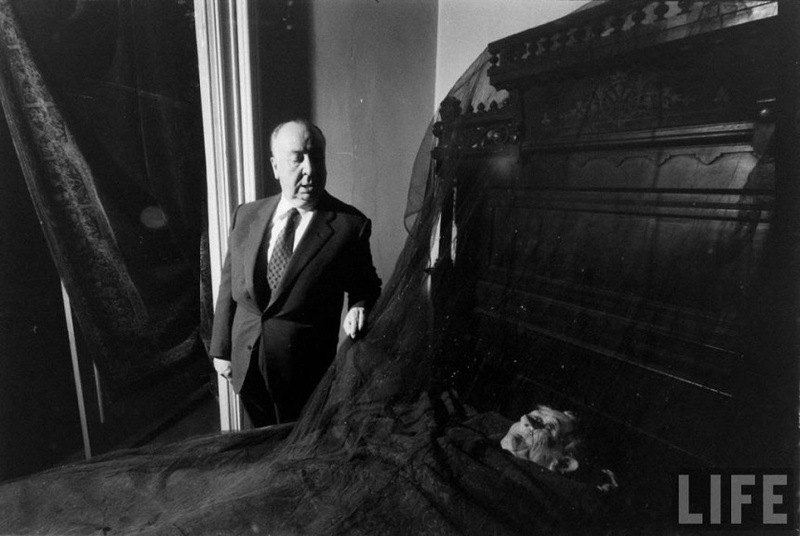 Sleeping up to six people, invite all your Hitchcock aficionados to stay in the luxury Spellbound room in Arthouse Hotel for Halloween. Maybe less of a stereotypical horror film, the Rocky Horror Show room echoes the extravagance and darkness of the iconic movie. A cult musical, comedy and horror classic, the film tells the story of a newly engaged couple whose car breaks down in a desolate area. 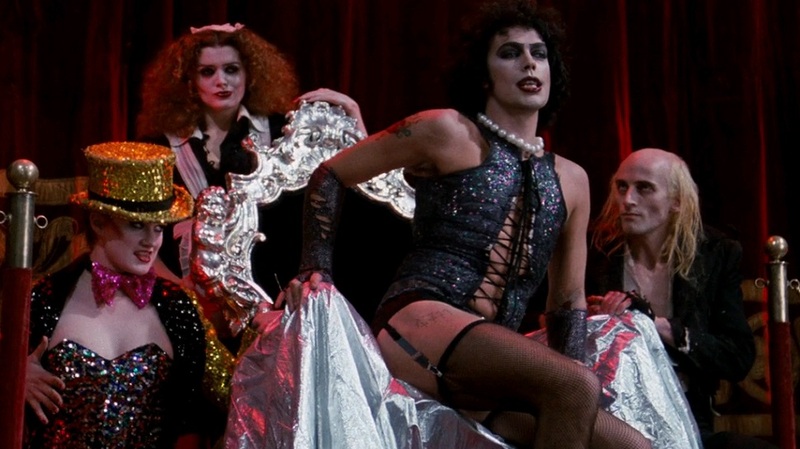 While in search of help, their journey takes an unforgettable turn when they stumble upon the weird and eerie castle of Dr Frank-N-Furter, an alien from planet Transsexual. When they enter the castle, they find it is full of strangers dressed in elaborate unearthly costumes and they are catapulted into a scary world of darkness. The film is famous for having a loyal cult following with midnight showings becoming all the rage, avid fans would dress up as the spooky characters to celebrate their love for this truly unique classic. Echoing the extravagance of the Rocky Horror Show, our fantastic themed room invites up to six guests to step into a time warp. This suite is perfect for booking group accommodation for Halloween in the city centre with family or friends. Featuring deluxe interiors and chesterfield walls, guests can make themselves feel right at home by sinking into one of our cosy, luxury beds or the relaxing double Jacuzzi bath. 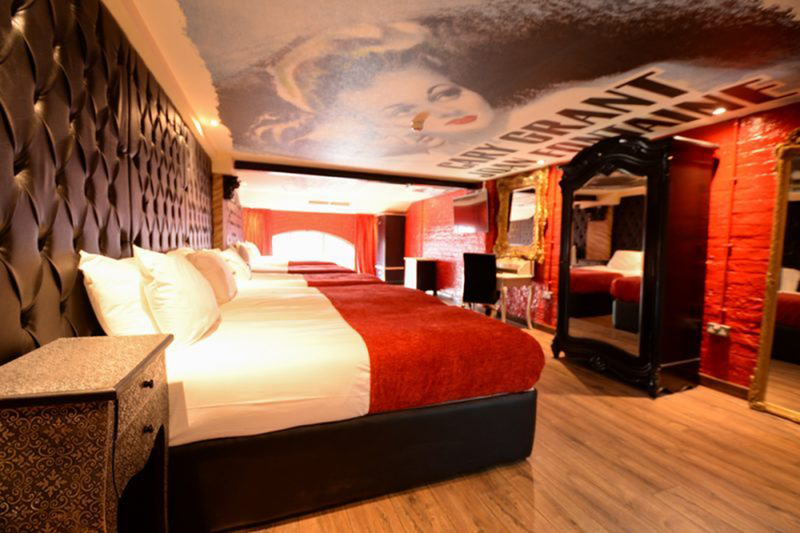 If you’re looking for an alternative Halloween, book a stay in our Rocky Horror Show suite and delve into the mad world of Dr Frank-N-Furter. The story of two women from the Jazz scene in prohibition-era Chicago, both accused of murder and awaiting trial on the infamous Murderess Row, Chicago is dark and brilliant classic. Velma Kelly is a nightclub singer, accused of the murder of her cheating husband and sister. Velma is the unrivalled star of the cell block until Roxie Hart is arrested for the murder of her lover, a crime her husband Amos initially took the fall for. Both women fight to be represented in court by Chicago’s slickest lawyer, Billy Flynn, conjuring up a media circus in the build up to their trials and singing and dancing their way to celebrity criminal status. With plenty of jail scenes, shadows and murderous women, this film is perfect for celebrating Halloween with a bit of razzle dazzle. The room sleeps up to six people, you and your friends are sure to fall in love with the black leather interiors and velvet features that take inspiration from the 1975 musical. 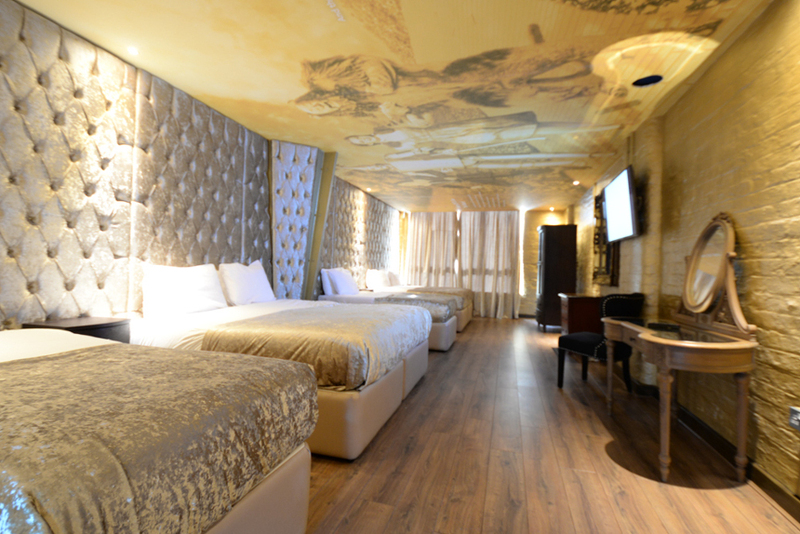 Enjoy the comfort of our luxury beds, kitchenette, large screen TV and a relaxing double Jacuzzi bath. You’ll never want to leave. 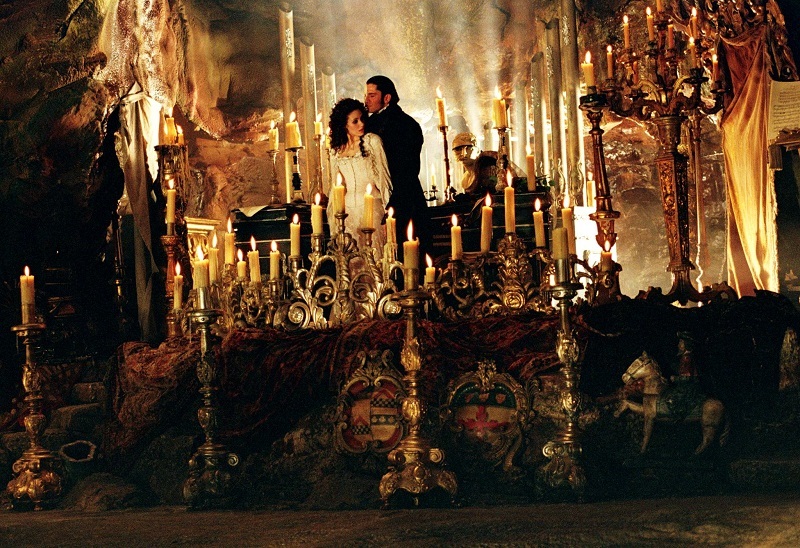 Last but certainly not least, is our decadent and mysterious Phantom of the Opera suite. Based on the French novel Le Fantome de lOpera by Gaston Leroux, the Phantom of the Opera tells the story of a bitter and badly disfigured man, known as the Phantom, who lives in the sewers underneath the Paris Opera House and haunts anyone who enters. He falls in love with the chorus opera singer and to get closer to her begins privately tutoring her. During these lessons he wears a long black cloak and mask to hide his scarred face. The story was inspired by historical event at the Paris Opera during the 19th century, and the mythical tale of using a former ballet pupil’s skeleton in the 1841 production of Der Freischutz. Due to the story’s popularity, it was adapted into various film and stage adaptations, including the 1925 film. 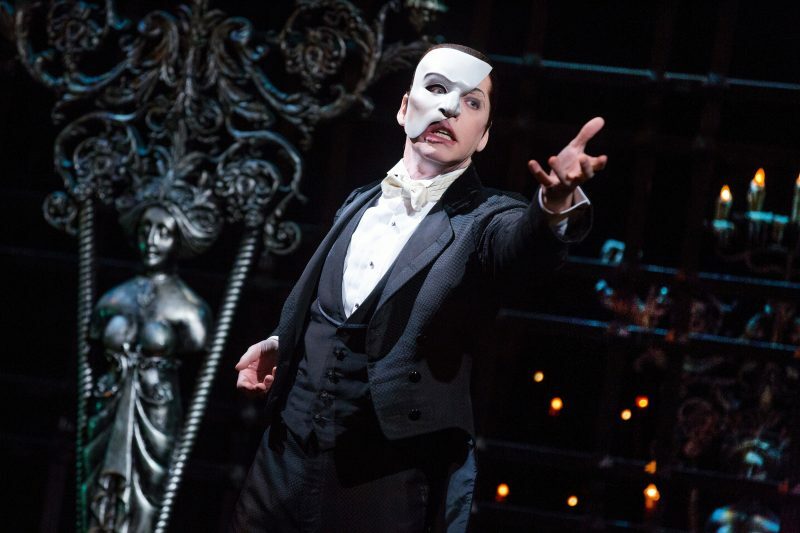 Hauntingly beautiful, the Phantom of the Opera has been deemed the greatest musical phenomenon of all time, offering stunning music and lyrics that has captured the hearts, minds and ears of international audiences. Our opulent room is a tribute to this amazing story, sleeping up to six people, it features a host of unique features ensuring that Phantom of the Opera at Arthouse is nothing short of magical. Arthouse Hotel is close to Liverpool’s city centre and just minutes walk to the vibrant and ever-growing nightlife. Pay special homage to Hitchcock’s legacy and the impact he left on the cinematic world with an entire floor dedicated to his most iconic films, or go for an alternative Halloween in the weird and wonderful Rocky Horror Show room. Just a few minutes walk from Liverpool’s thriving nightlife, restaurants and shops, Arthouse is the perfect hotel for Halloween in Liverpool. Call on 0151 601 8801 or email info@signatureliving.co.uk to book your stay at Liverpool’s best movie theme hotel for Halloween. 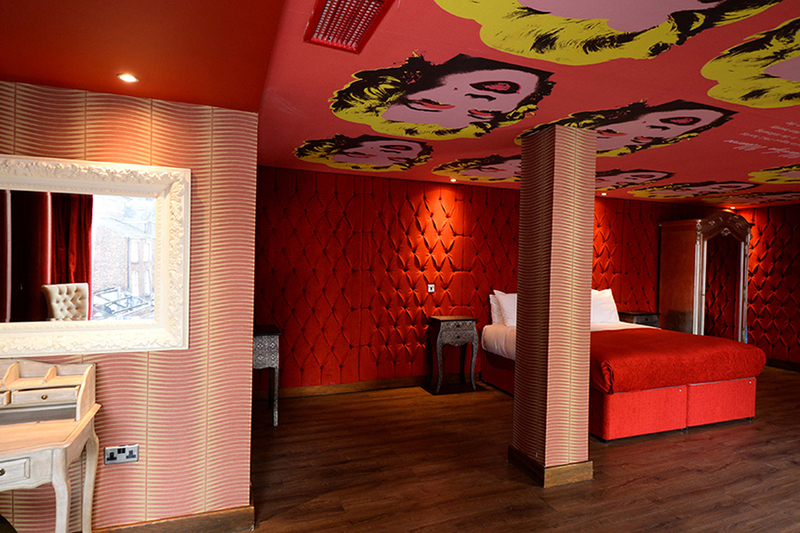 Arthouse Hotel is best loved as Liverpool’s movie themed hotel. So, it’s no surprise that our guests are fans of fancy dress! If you’ll be celebrating a special occasion or your hen party in Liverpool, Arthouse is the perfect hotel for you. 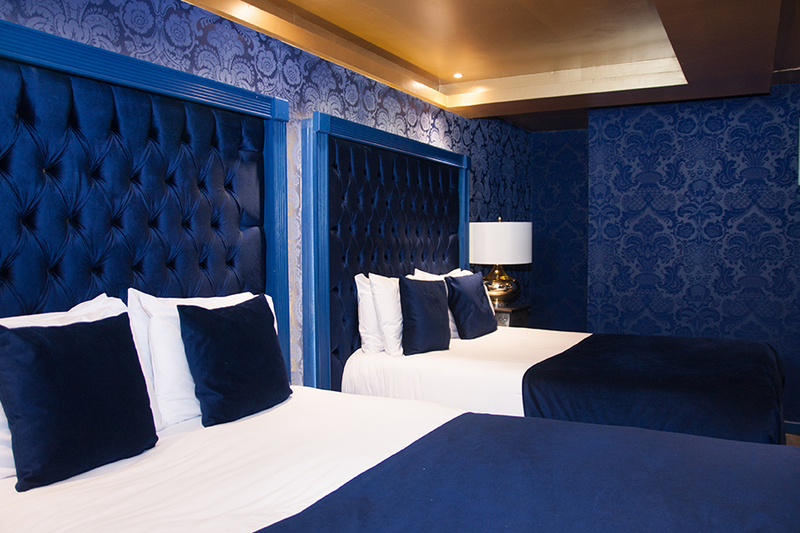 With an array of themed rooms, you can dress to impress and even match the theme of your room. Our dynamic rooms offer a fabulous backdrop for capturing your weekend on camera. Gather your most dazzling ruby slippers for the most spectacular Wizard of Oz hen party weekend. 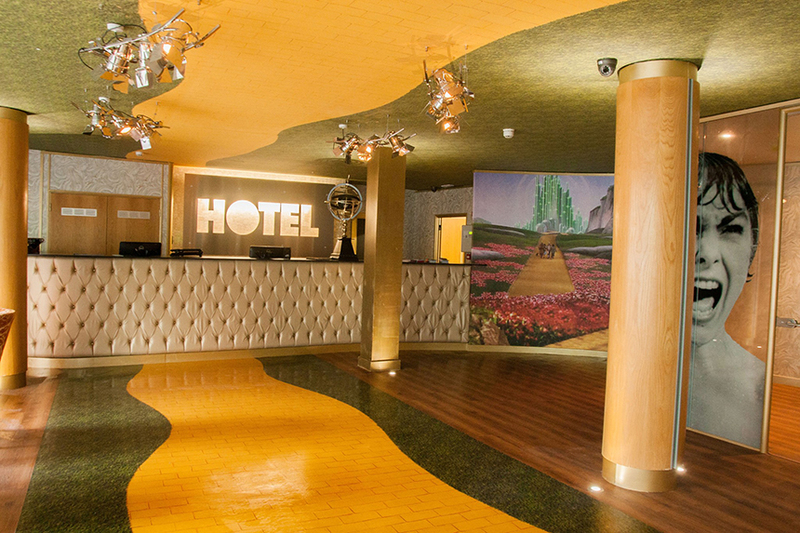 Our Wizard of Oz room is a fantastic space to celebrate an unforgettable weekend in the heart of Liverpool. Your hens may want to recreate the looks of Glinda and the gang to complement your theme. Whether you make the outfits hilariously fun or jazz them up with plenty of glitter, silver face paint and lion ears, the choice is entirely yours! Our stylish Grease room will have you giving it your best rendition of Greased Lightning in no time! With plush beds lined up for an entertaining weekend, you’ll be able to get ready with your hens and enjoy the weekend together from start to finish. Whether you go for the Sandra Dee look or add some Sandy sass with red lips and curls, our Grease themed room is awaiting you and your Pink Ladies! 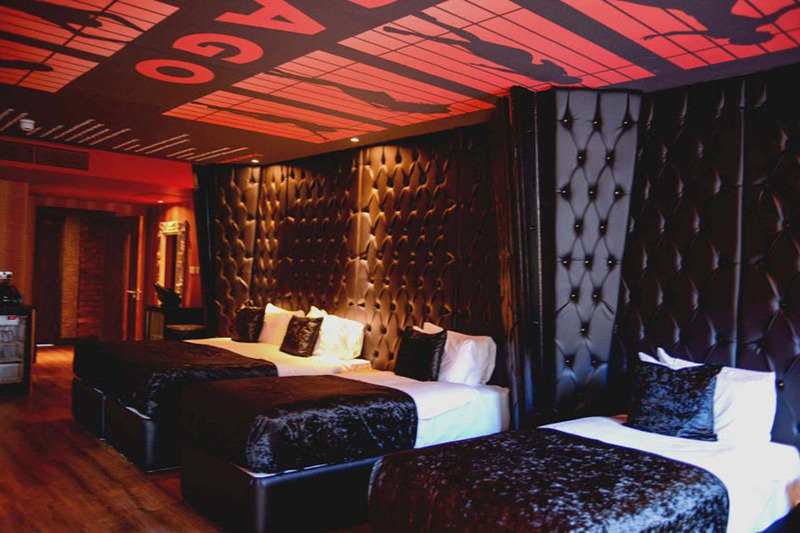 Our Chicago room brings All That Jazz to the heart of Liverpool’s nightlife scene. Perfect for a stylish stay in the city, your hens will fall head over heels with this luxury space. A fabulous excuse for fishnets, sparkles and your best dance moves, this dark and daring room is truly something else. 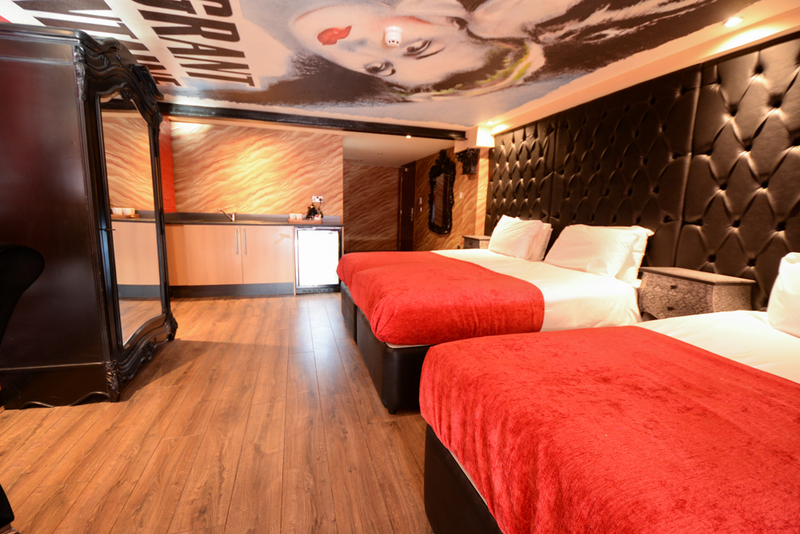 Our Marilyn Monroe room is the ultimate spot for capturing your very own Marilyn moment! You may want to create a mixture of looks for your fancy dress hen party. And as the gorgeous bride, why not channel the glamour of miss Monroe? Whether you choose a classic white dress or embrace the extravagance of Diamonds Are a Girl’s Best Friend, our Marilyn room will ensure you feel like a VIP. 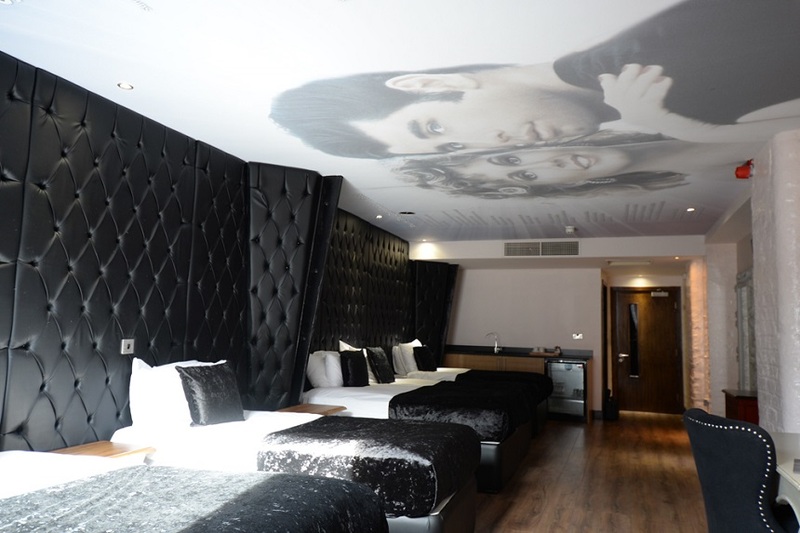 Arthouse Hotel is Liverpool’s leading movie themed hotel. 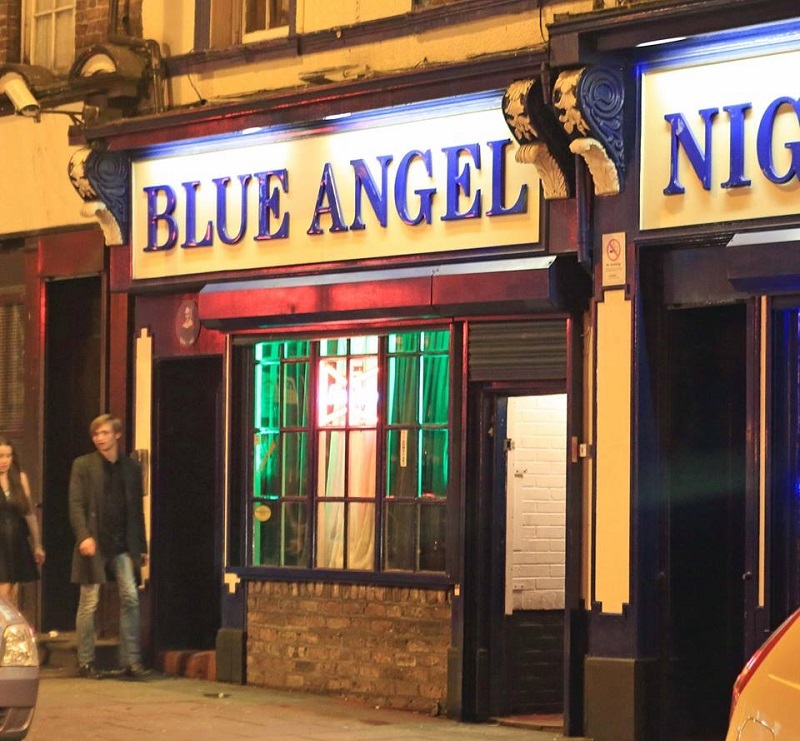 Located within the centre of Liverpool’s nightlife scene, there really isn’t a better location. You’ll find the best nightclubs, restaurants and cocktail bars in Liverpool right on your doorstep, so you won’t need to travel far. Upon stepping outside, you can choose from neon lit hideouts and cosy beer gardens to buzzing nightclubs and bustling bars. From chart music and guilty pleasures to old school indie hits, Liverpool truly has it all. Your hen party can be as stylish and sophisticated to wacky and wonderful as you like. And of course, it all begins at Arthouse. From the moment you arrive, we’ll be ready to take the reigns and make sure that your hen party is a success! 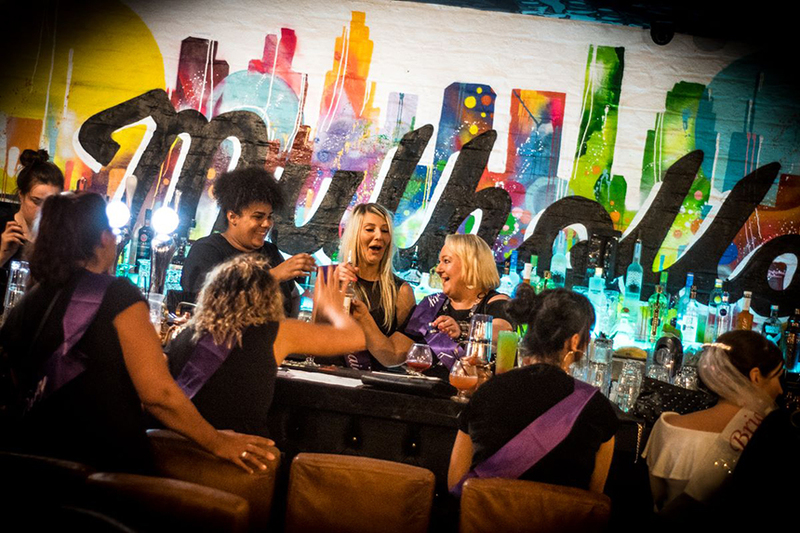 Your group of girls can enjoy tasty drinks and get the party started at our very own Mulholland Bar, located within the hotel. Mulholland Bar is in keeping with the theme of the hotel, offering everything from cocktail masterclasses to delicious food. With vibrant decor and a lively atmosphere, this is a great spot to start your night in style. Mulholland will also be there to cure your hangover and provide a hearty breakfast the following morning! We serve up everything from mouthwatering full breakfasts to healthier alternatives including refreshing avocado on toast. If you’d like to enquire further or book your movie themed hen party at Arthouse, you can contact us on 0151 601 8801.